Another listing changes hands as I learn that Michael Mahan at Worth Avenue Yachts has taken on the central agency for sale of the 30.8m motor yacht Moon River. The refit saw Moon River receive new engines, new interiors, new electronics, new ship’s systems and top to bottom fresh paint. 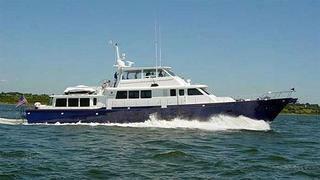 With accommodation for eight guests in four staterooms, Moon River is asking $3.75 million.